This post is meant for AP Physics C aspirants who are required to have some idea about Maxwell’s equations and their consequence. [This is Gauss’s law in electricity which states that the flux of the electric field E through any closed surface, that is, the surface integral of E.dA over any closed surface is 1/ε0 times the total charge Q enclosed by the surface. Note that E is the electric field vector present at an elemental area vector dA of the closed surface]. [This is Gauss’s law in magnetism which states that the magnetic flux through a closed surface is zero]. [This is Faraday’s law of electromagnetic induction which states that the induced emf in a circuit is equal to the time rate of change of magnetic flux ФB. The negative sign is because of Lenz’s law which states that the induced emf opposes the change of the magnetic flux]. [This is Ampere’s circuital law with Maxwell’s modification. The firest term, μ0ic on the right hand side contains the conduction current ic. The second term, μ0ε0(dФE/dt) was added by Maxwell to incorporate the displacement current id = ε0(dФE/dt). Note that the displacement current is produced because of the time rate of change of the electric field]. where D is the electric displacement vector which in free space is given by D = ε0E. curl B = μ0J + μ0ε0(dE/dt) = μ0 (J + dD/dt) since D = ε0E for free space. The concept of the displacement current was introduced by Maxwell from his understanding that all electric currents must be closed. For instance, in the charging of a capacitor, a conduction current ic flows in the wires connecting the capacitor to the charging battery and an equal (total) displacement current flows through the dielectric (or free space) in between the capacitor plates. The conduction current in the connecting wire and the displacement current in the space between the plates of the capacitor make a closed current circuit. But Q = CV where C is the capacitance and V is the voltage across the capacitor. Therefore dQ = CdV so that the displacement current i = CdV/dt. In the simple case of a parallel plate capacitor with air or free space between the plates, C = ε0A/d where A is the area of the plates and d is the separation between the plates. Further, V = Ed where E is the electric field between the plates. Therefore, displacement current i = (ε0A/d)×d×dE/dt = ε0A dE/dt = ε0dФE/dt, on substituting for the electric flux ФE = AE. The above steps show that the quantity ε0dФE/dt indeed represents the displacement current. Electromagnetic waves are produced by accelerated charges. An oscillating electric charge produces an oscillating electric field in space, which produces an oscillating magnetic field. But an oscillating magnetic field is a source of oscillating electric field. Therefore an oscillating electric charge can produce oscillating electric and magnetic fields which regenerate each other and an electromagnetic wave propagates through the space. The electric field and the magnetic field in an electromagnetic wave are perpendicular to each other. (Note that in charging a capacitor, the electric field in the space between the capacitor plates is directed perpendicular to the plates where as the magnetic field produced by the displacement current flowing through the space between the capacitor plates is along circles around the electric field lines). In the case of a plane electromagnetic wave propagating along the positive z-direction, the electric field is along the positive x-direction and the magnetic field is along the positive y-direction. 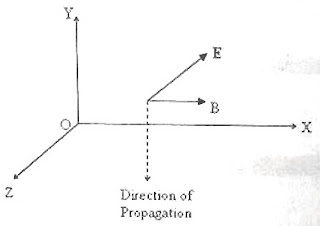 (i) The vectors E and B in an electromagnetic wave are perpendicular to each other and so oriented that the vector product (cross product) E×B points in the direction of propagation of the wave. As an example of the application of this rule, suppose the electric field vector is along the negative z-direction and the magnetic field vector is along the positive x-direction. This wave has to be propagating along the negative y-direction (Fig.). where c is the speed of electromagnetic waves. UE = ½ ε0Erms2 where Erms is the root mean square value of the electric field. [We use the root mean square value since the field is oscillating]. UB = ½ (Brms2/μ0) where Brms is the root mean square value of the magnetic field. Poynting vector S is directed along the direction of propagation of the wave. Since E and B are perpendicular to each other, Poynting vector has magnitude EB/μ0 which is equal to E2/cμ0. Note that this quantity represents the instantaneous power flow through unit area. In the next post we will discuss questions in this section. Meanwhile see these posts at physicsplus.